Eco Garden Maintenance offer a unique organic lawn care service in the Leeds, York, Selby, Wetherby and Tadcaster area. We are passionate about enhancing the environment, conservation, wildlife and using eco friendly methods of maintaining customers gardens and outdoor space. We provide several services which use organic techniques and find them to be extremely worthwhile and effective. The number of lawn owners who appreciate the value of using organic principles is growing all the time. It is difficult to have a totally weed free lawn using only organic methods. The grass must be healthy, dense and well maintained in order to provide competition and reduce the space available for weeds to germinate and establish themselves. Any visible weeds can be removed by hand if there are not too many and spreading weeds such as clover and speedwell can be prevented from spreading by regular raking and scarifying. Grass can also be helped to out compete lawn weeds by regularly relieving compaction and aerating to ensure deep rooting. In some cases we use a lawn care treatment schedule which is organic except for the use of selective herbicides for weed control. This works very well and is recommended to clients who want to be organic as possible but still have a weed free lawn. Eco Garden Maintenance have no problem with providing services to people who want a totally natural lawn which contains flowering native plants (weeds) as well as grass. Some clients like to see flowers in the lawn and if you are happy then so are we. However, even these lawns need some management to keep the looking lush and attractive. Scarifying, fertilising and aerating are all beneficial and are considered to be organic techniques even though they have a carbon footprint. Organic lawn fertilisers are very popular, easily obtained and do an excellent job of providing all the nutrients your lawn needs to be healthy and attractive. They feed the soil and the living creatures and organisms contained in it, unlike synthetic fertilisers which are an artificial quick fix. Organic products can add organic matter to your lawn which improves fertility, soil structure, drought tolerance and resistance to pests and diseases. Synthetic fertilisers can do none of this. Top dressing regularly with pure compost is an effective way to provide nutrients for the lawn, reduce compaction, increase drought tolerance and improve soil structure all in one go. Lawns which have been treated in this way still look green in the middle of summer when most have gone a brown colour and stopped growing from lack of water. It is worth mentioning mulch mowing here as it is an important part of organic lawn care. The purpose of mulch mowing is to return all the lawn clippings back to the soil along with the nutrients and water they contain. In theory this reduces the amount of fertiliser that needs to be added to a lawn, provides organic matter back to the soil and increases the drought tolerance of the grass. In our experience it is only effective when the grass is dry and not too long. If the grass is wet the result can be lumps of grass left all over the lawn and if the grass is too long the clippings will clearly be visible as the mower cannot cope. We have used mulch mowing effectively but only in summer on regularly maintained lawns. In this circumstance it has the added benefit of shielding the soil from the sun and thus reducing water loss. 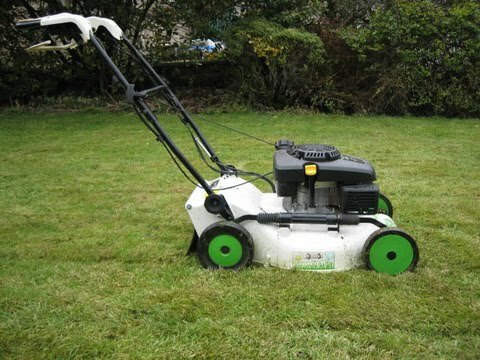 Please contact Eco Garden Maintenance to enquire about our unique eco friendly organic lawn care service.